As the premier contract roaster in North America, Goodson Bros. creates the best individualized private-label programs, with a full range of wholesale products and services. Goodson Bros. can match any taste profile that you have in mind, or we can develop a unique one just for you. The Goodson Bros. philosphy is to meet all of our customers' unique needs and to help each of them maintain their reputations for excellence. Services, price, packaging requirements, turnaround time and the ability to trace from packaged coffee back to the green coffee shipment are all key considerations that we are happy to customize for each client. Our customers appreciate the value and benefits of working with a single-source supplier for all their coffee needs. Large coffee companies, with nationally recognized brand names, who want to outsource new or existing products that may be unprofitable for them to manufacture in house. Call us today to find out how we can help you meet your coffee needs. With generations of roasting experience, the master roasters at Goodson Bros. can make your perfect coffee. 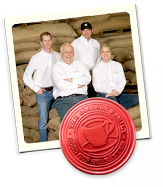 Let Goodson Bros. help you bring your customers back again and again with the best in private label coffee.